It’s been a while since I’ve written about being thankful, so here goes. Today I’m thankful for PRD. For those of you not in the know, that’s (P)ast (R)elationship (D)etritus. PRD are items (tangible or intangible) that you are left with from previous relationships, either because the items were gifts, or weren’t worth taking by the other party when they split, or the other party didn’t remember that you had them to begin with and you lucked out. My special thanks to Daddy Confidential for inspiring this list (in a roundabout way; he is neither my ex, nor has he written about PRD TTBOMK). If you’re not reading his stuff, go. Go now. 1. Hand-made wooden keepsake box. This was a gift from Highschool Sweetheart that he made for me himself, and it’s something I’ll always treasure. He also programmed a game for me (being the recreational programmer that he was) but I unfortunately don’t have a copy of it (or an operating system to run it on) anymore. 2. The Princess Bride (the movie). Also from Highschool Sweetheart. Aaaaas yooouuuuu wiiiiish! He didn’t leave me a copy of the movie; he showed it to me the first time and got me hooked on the soundtrack (Mark Knopfler, yeah!!!). 3. Monty Python and the Holy Grail. “There are those who call me… Tim?” Yup, Highschool Sweetheart again. Yes, I dated nerds. Got a problem with that?? 4. The Princess Bride (the book). From Theater Guy (I did summer stock theater with him one year… oh thespians, oh youth!). If you haven’t read the book but love the movie, I cannot stress enough how AWESOME the book is. Luckily the screenplay was co-written by the same author, William Goldman, so it doesn’t stray too much from the original novel. However, the novel is in all ways more detailed and engrossing (as novels which are adapted into films are wont to be). I have made it a point to leave copies of The Princess Bride to subsequent exes in an effort to improve the quality of PRD for others. It’s a version of paying it forward. 5. Monty Python (beyond The Grail). Also from Theater Guy. He got me started by inserting skits from the CD The Final Rip-Off into mix tapes that he made for me (yup, real honest-to-god mix tapes). Wink-wink, nudge nudge, say no more! 6. A shirt. A very old, now definitely holey shirt. It’s really damn comfortable. I also had a sweatshirt, but Theater Guy actually wanted that one back. Luckily this shirt held no emotional significance for him. Almost twenty years later I’m still wearing it around the house and loving it. Somehow clothing stolen from boys is just so much better (at least for relaxing and sleeping). 7. Batman: The Dark Knight Returns graphic novel. Theater Guy again. We won’t go into the psychology of this here. Let’s just say it was a seminal read for Theater Guy, and I appreciated it for being that. I was never into graphic novels myself (except for when TG also introduced me to the Sandman Chronicles) but I read this one a few times as it definitely got me caught up in the story. It has made many moves with me from dorm to apartment to apartment… and eventually to our house. It will probably still be here when G is old enough to read, and I know TG will appreciate it being handed on to the next generation (especially as I know he has twin girls who may or may not be interested in dark superhero comics). 8. Ben & Jerry’s teddy bear. Ok. So officially I bought this for myself. However, I only did so because I was in Vermont at the time visiting Vermont Guy (he was at work, and being bored and by myself in Vermont, I took myself to the Ben & Jerry’s factory). For the longest time, the bear actually smelled like B&J chocolate ice cream (in a good way). At this point it’s lost its scent, and it lives in a plastic bag surrounded by the few other stuffed animals that I’ve acquired (but couldn’t ditch) over the years. I’d like to go back sometime and get a new one that smells like ice cream again, but I don’t have any reason to be in Vermont any more, so I don’t see that happening any time soon. 9. Faux-Tiffany lamp. This was originally Jane’s Guy’s (his earned his moniker by keeping up with Jane’s publications) lamp and somehow I ended up with it. Luckily, it looks awesome in my living room. I assume this is a faux-Tiffany because I can’t find any Tiffany stamps on the base, and M is pretty sure the shade is made with colored plastic instead of glass. In the end, it looks awesome, so who cares? 10. 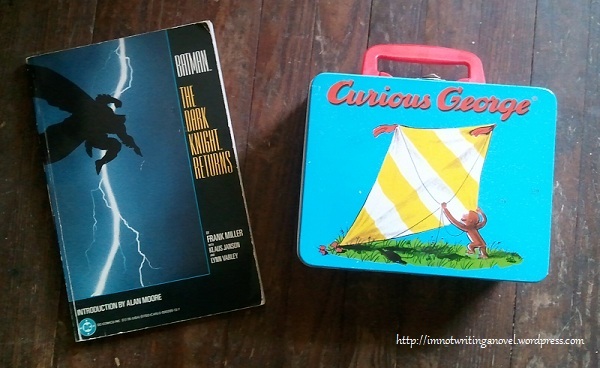 Curious George lunchbox. Another straggler from Jane’s Guy’s possessions. I remember him really liking it — I don’t know why I have it. However, it’s cute, and I’m sure it will be put to good use sometime soon for G whose belongings are multiplying exponentially and are always in need of containment. 12. Honig Cabernet Sauvignon. This one came from Bartender Guy. He recommended it the first time I ate at the restaurant where he worked. I ended up imbibing many glasses over a number of months as I took myself out to dinner, always sitting at the bar to chat with him. We never actually dated. He’d just come out of a long relationship… well, for whatever reason, I thought he just wasn’t that into me. However, when I came in one night with M (as we began to get serious), Bartender Guy all of a sudden became VERY interested. He wandered over to our table (as I thought sitting at the bar would just be weird given the situation), gave me a HUGE hug (he’d previously never touched me, not even a hand brush on the bar), and then made sure that the wait staff asked us if we wanted our leftovers packaged in the same bag (to see if we were going home together). It was rather flattering. Too bad he didn’t make a move earlier. Well, not really, I’d rather have M any day of the week. But back to the wine. It’s fantastic. I still buy it, and though I haven’t yet found a year as good as the 2004 I had way back when, it’s still damn fine. Go drink some. And there you have it. What are your favorite items of PRD? What have you left as PRD for others? That’s some good relationship swag you’ve built up over there! I know, isn’t it great?? I actually read it aloud to M and we had so much fun with that. Okay I’m just giving you a hard time. Let’s see, I’ve got this t-shirt that shows silhouettes of all these sexual positions. I thought it was very clever at age 18. My ex-girlfriend from then gave it back to me – 15 years after the fact – as a joke. But now my wife loves wearing it. Sort of strange, that.